Description: This is a moderate 10.2 mile circuit hike with some partial views along the AT and very scenic Thornton River. There are about 4 stream crossings of note. 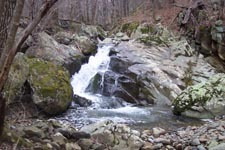 There is 1400 foot elevation gain over 3 miles as you ascend from the bottom of Thornton River to the AT. Note: The Google directions have you going to the Elkwallow Wayside. You want to park in the back of the Elkwallow Picnic Area at the Jeremys Run Trailhead. Trail notes: The descriptions I've seen of this hike always use a one mile in and out route from outside of the park boundary. 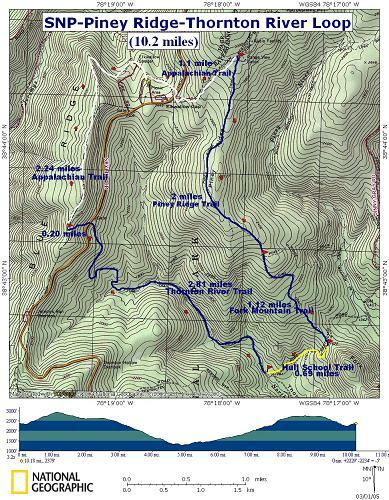 The hike described here removes this route by starting the hike at the Elkwallow Picnic Area. An alternate starting point is at the Thornton River Trail parking lot between mile post 25 and 26. From the parking area in the Elkwallow picnic area descend down the white-blazed AT spur trail. At the junction with The main AT turn right. Cross Skyline Drive and gradually ascend almost to the top of Piney Ridge. Turn right onto Range Cabin Service Road. The Range Cabin Service road will bear left and go slightly downhill to the cabin. Blue-blazed Piney Ridge Trail continues straight as a foot path. 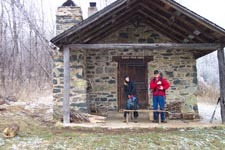 Continue the hike on Piney Ridge Trail or stay on the service road and visit the Cabin w/spring. 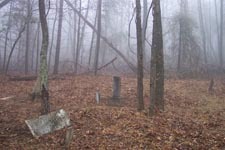 Return to the the junction of blue-blazed Piney Ridge Trail. Turn left onto Piney Ridge Trail and follow this to blue-blazed Fork Mountain Trail. Just prior to this junction on the right is an old cemetery. Piney Ridge Trail will turn sharply left. 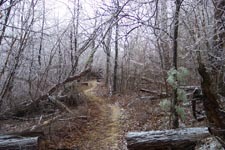 Stay straight on Fork Mountain Trail and follow it to the intersection with yellow-blazed Hull School Trail. Turn right on Hull School Trail and descend to Thornton River. Turn right on blue-blazed Thornton River Trail. Ascend, crossing Thornton River 4 times. Reach the Thornton River Trail parking lot through a series of gradual switchbacks. 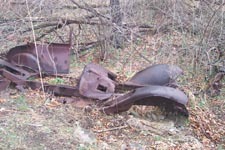 Cross Skyline Drive, bearing slightly to the left, to regain the remainder of the Thornton River Trail. Climb via switchbacks to the junction with the white-blazed AT. Turn right on the AT and follow it back to your cars in the Elkwallow Picnic area passing Jeremy's Run trail on your left as you go. Critique: The hike was nice with lots of canopy cover to keep you cool. 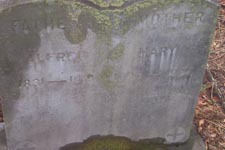 Some interesting spots like the graveyard and the shelter at the beginning of the hike. Not too many camp spots but did find a good one on the Thornton River section. Once you make the first river crossing it is about 30 yards from the river to the left in the hollow. There are no overlooks on this hike thus the 3 ranking but it was definitely worth the trip. Critique: Nice hike along a river (very low this summer) and back along the AT. Vistas mainly confined to the AT. Beautiful stand of Tulip Popular trees along the Fork Ridge Trail. 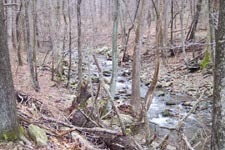 The Fork Ridge Trail section is particular is overgrown with numerous trees across the trail. We only met 2 other hikers during our 5 hours on the trail and it was a beautiful summer Saturday. Critique: Nice moderate length hike with enough terrain to satisfy. Started just before sunrise with the hope of seeing more wildlife. Several deer and one bear seen on the Piney Ridge Trail. Water is low in the river, but what a nice hike upstream. Some trees are in full color.